B Taksande, A Jain. “F” WAVE: Clinical Importance. The Internet Journal of Neurology. 2008 Volume 10 Number 2. In a typical F wave study, a strong electrical stimulus (supramaximal stimulation) is applied to the skin surface above the distal portion of a nerve so that the impulse travels both distally (towards the muscle fiber) and proximally (back to the motor neurons of the spinal cord) as shown in figure 1. Figure 2: Normal F response by stimulating median nerve and recording from abductor pollicis brevis. The minimal latency is most reliable and useful measurement. Errors in placing the markers are common which may alter the latency. The markers are best placed at a point where it departs from the baseline. In addition superimposing the traced once all the responses are obtained often is helpful in determining the minimal latency. F latency vary with the height of the patient. F responses are longer in tall patients .The upper limit of minimal F latency is 31ms for female and 34.4 ms in normal males(Nelson et al 1990).The right to left asymmetry of minimal F latency exceeding 2 ms in hand and 4 ms in foot is considered abnormal. F-waves are required for estimation of chronodispersion (50-60). It basically refers to the difference of maximal and minimal latencies in a series of F waves. I t is highly sensitive for diagonising demyelinating neuropathy. The ratio of F wave amplitude to the associated M wave (FM ratio) is a measure of proportion of motoneuron pool activated by antidromic stimulation. It helps in diagnosis of axonal neuropathy though not highly sensitive. It is a measure of antidromic excitability of a particular motor neuron pool. 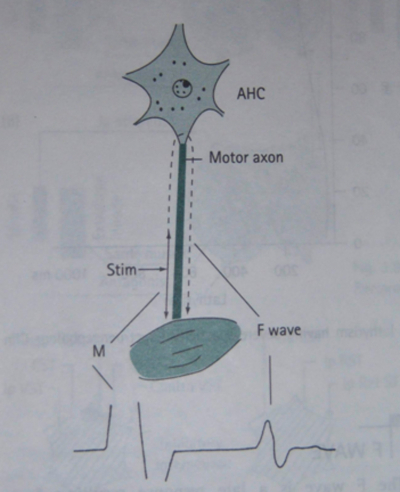 It is decreased in axonal neuropathy. It is calculated by dividing the number of F responses to the number of stimuli. Where D is the distance from stimulation site to the spinal cord, Cv is conduction velocity, DL is Distal motor latency and 10 is the conversion factor to milliseconds. The actual measured F response is shorter than F estimate. Therefore, if F response is prolonged as compared to the F estimate it is suggestive of proximal nerve segment injury. It checks only the nerve or nerve segments which innervates the muscle being recorded. Could not check for radiculopathy affecting the sensory nerve root fibers, as F response measures the motor fibres. Could measure only severe radiculopathy or plexopathy. 2. Fisher MA. F-waves--physiology and clinical uses. Scientific World Journal 2007;7:144-60. 6. Mesrati F, Vecchierini MF. 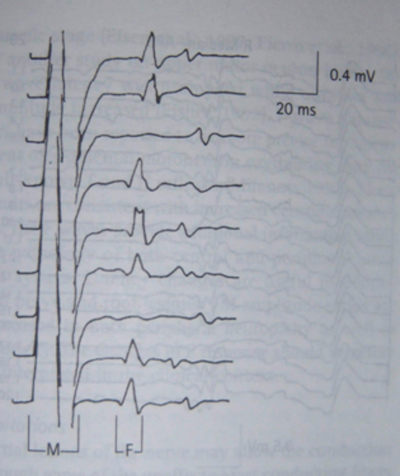 F-waves: neurophysiology and clinical value.